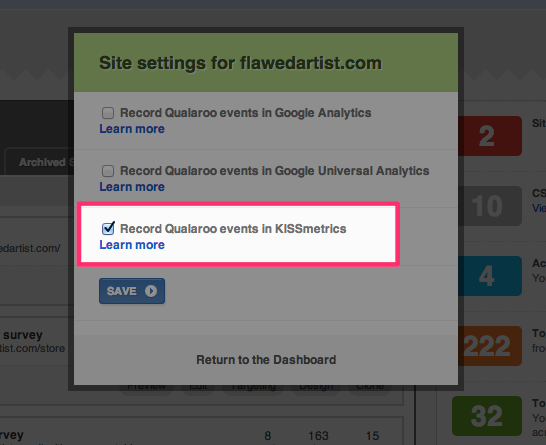 Our Startup, Growth, Turbo Growth and Enterprise plans come with the KISSmetrics integration. Qualaroo publishes its data by recording events. Then click on the integration and save your changes. Correlate quantitative behavioral data ("what users did") recorded by KISSmetrics with qualitative data ("what users said") produced by Qualaroo surveys. Monitor the performance of your survey. What is your response rate? Are more users answering your questions and clicking on your calls to action, or are they closing the popups? Break this by segment and understand how to improve. Below are some examples of what the integration looks like.